(Recto, print) initialed in pencil, at lower right corner: "F.H.E." (Recto, mount) signed and dated in black ink, at lower right edge: "Frederick H. Evans [space] 1896"
(Recto, mount) inscribed in black ink, at lower left edge, by Evans: "Kelmscott Manor: In the Attics (No. 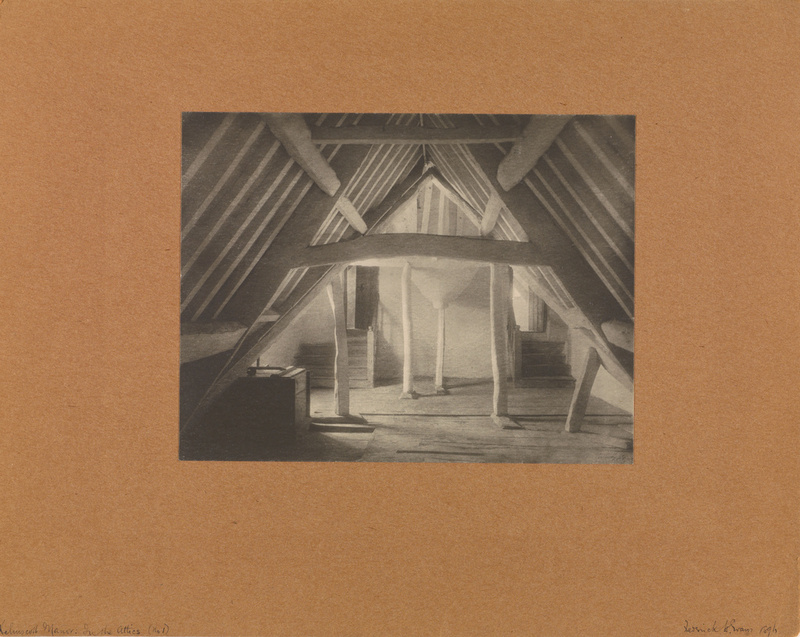 1)"
Frederick Evans's architectural study of the attic at Kelmscott Manor, a medieval house, part of which dates from 1280, is a visual geometry lesson. The composition is all angles and intersections, formed not only by the actual structure but also by the graphic definition of light within the space. Soft illumination bathes the area near the stairs, while the photograph's foreground plunges into murky darkness. The sharp angles of intersecting planes are mediated by the rough-hewn craftsmanship of the beams and posts, almost sensuous in their sinewy imperfection and plainly wrought by hand. The platinum print medium favored by Evans provides softened tonalities that further unify the triangles, squares, and diagonal lines of the dynamic composition. The J. Paul Getty Museum Handbook of the Collections. 7th ed. (Los Angeles: J. Paul Getty Museum, 2007), p. 305, ill.